Step up your game with the latest additions to Miller’s Sports & Events and Schools lineup. Stylish and durable, the new Metal Water Bottle scores major points with players and parents alike. We’ve also added outstanding new designs for Stand Ups. Select your template, drop in an image and customize with name, year and team color for a knockout display. Don’t worry; we’ve been doing our schoolwork too. 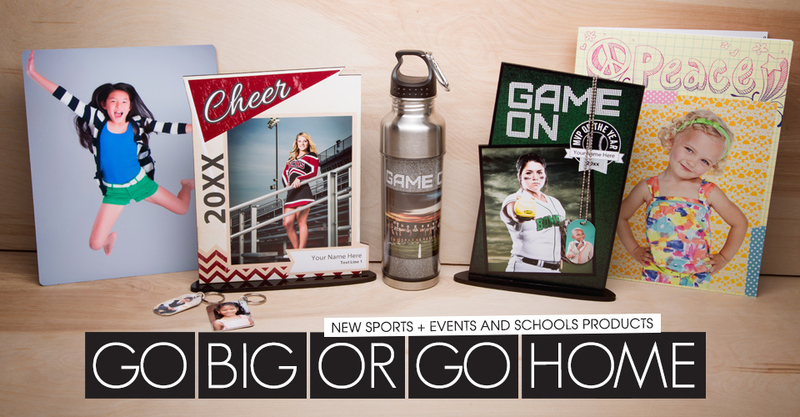 From Metal Display Prints to Vivid Keychains, our Schools selection is loaded with fun trinkets and goodies for the family. Print Package Books are a great way to show off Prints with a personalized touch and we have added new templates for your favorite students. Check out Miller’s Sports & Events and Schools to learn more! I love your sports and events line. Customer service is amazing and product line is always high quality. One thing that I do a lot of and is huge right now in the sports arena is team and individual posters. Everybody wants them! I would love to see more options in terms of sizes in regards to posters. I have ordered the 12″X18″ poster size and have been extremely happy with them as well as my clients. But, sometimes that’s just not big enough. Have you thought about offering large sizes? Thanks!!! Thanks for the kind words, Kathy! We’ll pass this suggestion along to the Sports & Events team. I love all of your products, but I REALLY wish you had some Roller Derby templates! I shoot several women, men, and youth leagues. They want cool stuff, too! Thanks so much for the feedback, Cat! I would love to be able to offer larger posters as stated above. A lot of baseball/football tournaments offer 12×36 prints of teams and I have had quite a few coaches ask about that size. I would love to be able to order those from Milllers and know they are great quality like everything else I order from you!